Objective: CDK9/Cyclin T1 kinase is a protein kinase, indirectly involved in the cell cycle progression in the form of transcription elongation, CDK9 specific inhibitors may be a potential alternative treatment not only for cancer but also other life-threatening diseases. Materials and Methods: Ligand-based and structure-based pharmacophore model was developed for discovering of the new anticancer agents. These models used as three-dimensional query for virtual screening against the chemical structure databases such as Maybridge HitFinder, MDPI, and ZINC. Subsequently, the potential hit compound was filtered by the ADMET and docking score. Results: After applying all filtration, 11 hits were found as potential hits based on good docking scores as well as good ADMET properties. Compound 2-[4-[6-(isopropylamino) pyrimidin-4-yl]-1H-pyrrolo[2,3-b] pyridin-6-yl] amino] ethanol was found to be most potent among all the potential hits. These hits could be used as an anticancer agent in near future. Conclusions: So many advances in the treatment of death leading diseases have been made over the past few decades, However, looking for the development in this research ligand-based and structure-based pharmacophore modeling was done, hit1 2-[4-[6-(isopropylamino) pyrimidin-4-yl]-1H-pyrrolo[2,3 b] pyridin-6 yl] amino] ethanol was found to be more potent and selective. It is understandable that these hits could be as selective and potent anticancer agents of cyclin-dependent kinase complex. CDK kinases play a very crucial role in the regulation of the cell cycle process, its activation as well as regulation maintains cell division, changing the transition state and entry into the mitosis phase, cancer and several proliferative diseases occurred because of the alteration in the cell cycle.,, CDKs take part in the different processes such as apoptosis, neuronal cell functioning as well as transcription., Among all the CDKs one of the CDK is CDK9, which is also known as cdc2-like family of kinases. It involves in the transcription elongation (controlling the gene expression) phase, apoptosis as well as cell differentiation and cell proliferation when it is paired with the cyclin units and makes the P-TEFb complex (CDK9/Cyclin T1). The structure of CDK9 with Cyclin T1 is shown in [Figure 1]. The Cyclin T1 well known as CDK9 regulatory subunit and it has been confirmed by the in vitro and in vivo studies.,,,,,, Thus, CDK9 is the most important target for cancer prevention. After completing a literature survey, some inhibitors have been identified which shows their promising binding affinity such as 2-Anilino-4-(thiazol-5-yl) Pyrimidine, 4-Arylazo-3,5-diamino-1H-pyrazole, DRB, which make halogen bond with the CDK9 active hinge region, flavopiridol,, roscovitine, CR8,, and CAN-508. 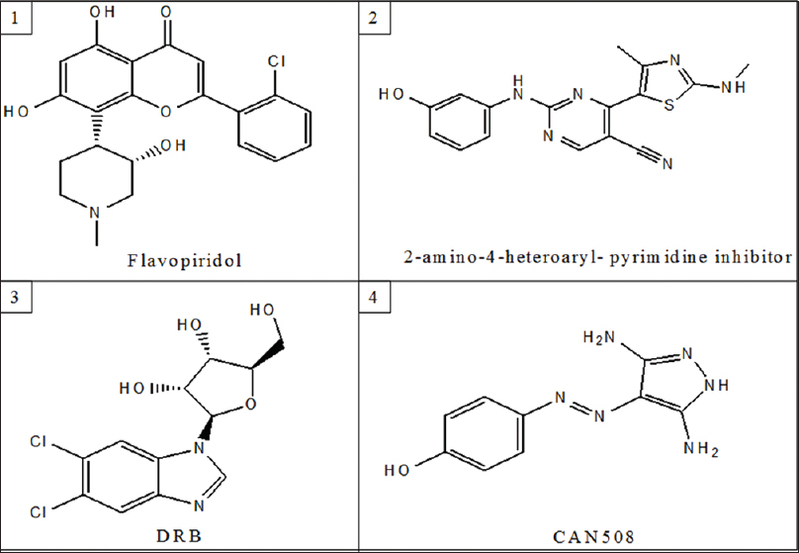 A few co-crystallized CDK9/Cyclin T1 inhibitors have been searched out from the Protein Data Bank such as Flavopiridol, (1) 2-amino-4-heteroaryl-pyrimidine (2), DRB (3), and CAN-508 (4) presented in [Figure 2]. Hence, there is still need to find out a new class of drugs with better binding affinity in the active site of the target for the treatment of death leading diseases such as cancer, AIDS, cardiac hypertrophy, and several proliferative diseases. 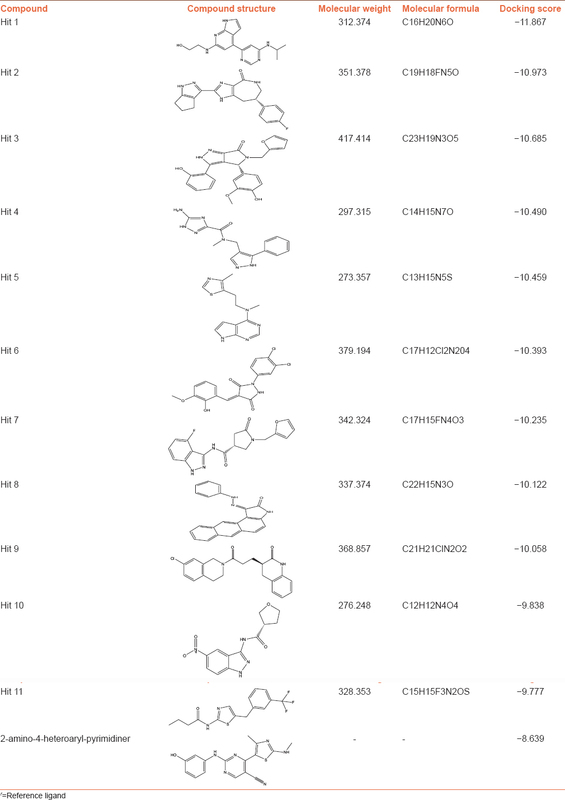 The aim of this study was to design a workflow for the discovery of novel potential CDK9/Cyclin T1 inhibitors searching out of drug databases. We validated our approach with the already bind inhibitor and studies new, not yet analyzed other chemical lead compounds which show their Kinase inhibition potential. Pharmacophore generation, screening and docking studies were carried out with the vast literature survey. The qualitative common feature-based pharmacophore model was generated using LigandScout 3.12 software with the help of three best co-crystallized active ligands. 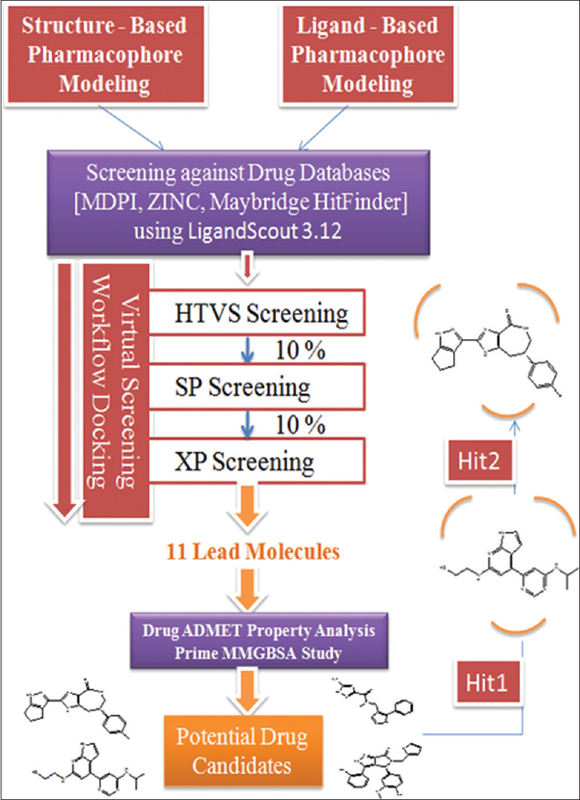 A LigandScout software tool that allows to fast and transparently deriving ligand-based pharmacophores from structural data of ligand in a fully automated and appropriate way. Among three, two ligands were selected as training (Flavopiridol and DRB) and one ligand was selected as a test ligand (CAN508). This pharmacophore model was further subjected to the virtual screening against the drug databases (MDPI, ZINC, MayBridge HitFinder).,, The ligand-based pharmacophore model was shown in [Figure 4]. The target (CDK9/Cyclin T1) complex structure was downloaded from the Protein Data Bank (PDB ID: 4BCJ) and prepared using the protein preparation wizard of the Schrodinger software. The target structure was loaded into the Prep Wizard where hydrogen atoms were added, and bond orders were assigned, In the final stage, a restrained minimization step was performed with the RMSD cutoff of 0.30 Å and OPLS-2005 force field. The small molecules (pharmacophore matched) were retrieved from the screening result of the LigandScout software. These all molecules were exported into the SDF format and prepared using the LigPrep module of the Schrodinger software. In the preparation step, the bond order and the bond angle were assigned, then minimization was ended using OPLS-2005 force field, and for keeping ligand in the correct protonation state, the Epik option was used. The grid of the protein structure was prepared using the Glide protocol. The 2-amino-4-heteroaryl-pyrimidine inhibitor binding site was selected as centroid for the cyclin-dependent kinase as well as partial charge cutoff was selected as 0.25 and scaling factor was selected as 1.0 respectively. The 2-amino-4-heteroaryl-pyrimidine inhibitor was retrieved from the co-crystallized structure of protein-ligand complexes from the PDB. This inhibitor was also prepared by the LigPrep module of the Schrodinger software and docked with the CDK9 kinase again and kept as a reference for finding potential hits from MDPI, ZINC and Maybridge HitFinder databases. Ligand-protein docking was performed using Glide maestro protocol. Pharmacophore features matching screened compounds were subjected to the Lipinski filtration and reactive functionality. The reference compound also incorporated with these compounds. Docking (HTVS, SP, and XP) was performed against the target protein. The pharmacophore feature matching screening using LigandScout and the docking workflow is shown in [Figure 5]. The best hits were chosen for finding the drug-like properties. These properties include the Lipinski's rule of five and the properties were molecular weight (MW), HBA, lipophilicity (log P), HBD, and human oral absorption. The other drug properties were also identified like total solvent accessible surface area (SASA) in square angstroms using a probe with a 1.4 Å radius, predicted aqueous solubility, predicted polarizability in cubic angstroms, predicted hexadecane/gas partition coefficient, predicted octanol/gas partition coefficient, predicted water/gas partition coefficient, predicted octanol/water partition coefficient, conformation-independent predicted aqueous solubility, log S. S in mol dm–3 is the concentration of the solute in a saturated solution that is in equilibrium with the crystalline solid, predicted skin permeability, log Kp, prediction of binding to human serum albumin. ADMET properties are related with absorption, distribution, metabolism, excretion, and toxicity through the human body. The ADMET analysis is very important for evaluating the pharmacodynamic activities of the ligand compounds. Bioinformatics tool admetSAR (http://lmmd.ecust.edu.cn/admetsar1/predict/) was used for this study. Drug-target binding energy estimates the stability of the protein with the ligand complexes. This Molecular mechanics generalized born surface area (MM-GBSA) was used to calculate the binding energy using Schrodinger software. Pharmacophore feature matching screening and receptor-based docking approach was used for finding the novel hit compounds. Several drug databases (MDPI, ZINC, Maybridge HitFinder) were used for this study. After completing the ligand-based and structure-based pharmacophore modeling, the pharmacophore model was used as a 3D query for screening against the drug databases. There are so many hits was found which showed the features such as pharmacophore model. The hits were incorporated in the Maestro for docking. Total eleven hits, compounds were identified which showed best binding affinity with the target protein. Hit 1, 2-[4-[6-(isopropylamino) pyrimidin-4-yl]-1H-pyrrolo [2,3-b] pyridin-6-yl] amino] ethanol was found to be more potent as well as selective hit, which interacts with the target CDK9/Cyclin T1 kinase protein active site residues. It showed hydrogen bond interaction with residues (Cys106, Phe168, Glu66) with docking score − 11.867. The docking score is more negative and the more negative binding energy indicates more favorable interactions, and it covered the active binding site completely. This research study potentially suggested that Hit 1 is tightly docked in the active site of the CDK9/Cyclin T1 kinase and showing good inhibition characteristics. The docking score for all the potential hits was identified [Table 1]. All selected hits 2D structure presented in [Figure 6]. Docking with LigPlot interaction diagram gives a better presentation of binding between the target and the hits compounds [Figure 7]. The docking score of all the selected hits was compared with the reference ligand in [Figure 8]. Drug-likeliness property analysis is the evidence for drug-like characteristics. The selected hits were evaluated, followed the Lipinski's rule of five. A good drug always recognized which shows good metabolism property, absorbed in the timeline and well distributed throughout the system. The QikProp tool of the Schrodinger software was used for this purpose. 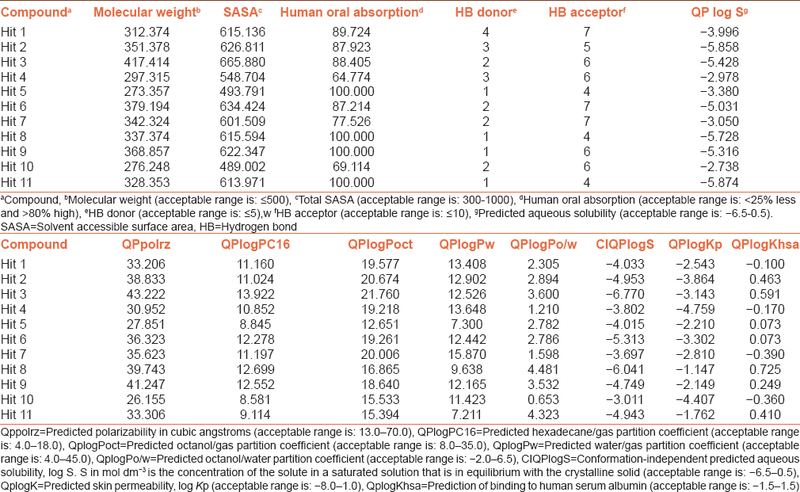 Our selected properties were MW, HBA, HBD, total solvent accessible surface and predicted aqueous solubility (QP log S) and human oral absorption, others were total SASA in square angstroms using a probe with a 1.4 Å radius (SASA), predicted polarizability in cubic angstroms (QPpolrz), predicted hexadecane/gas partition coefficient (QPlogPC16), predicted octanol/gas partition coefficient (QPlogPoct), predicted water/gas partition coefficient (QPlogPw), predicted octanol/water partition coefficient (QPlogPo/w), predicted skin permeability, log Kp (QPlogKp), and prediction of binding to human serum albumin (QPlogKhsa) were assessed. The lower MW is an indication for good absorption of the drug compounds. Lower the total SASA was favorable for drug-like properties. The eleven potential hits with their drug-like properties were represented in [Table 2]. ADMET properties of the selected hit compounds were identified using admetSAR server. BBB probability, Caco-2 probability, human intestinal absorption (HIA) probability indicated good value where BBB represents the blood-brain barrier which should be high, The higher value of BBB gives the better penetration as well as HIA score is high would be absorbed better in the intestinal tract on oral administration, For finding out that the hits were mutagenic or not the AMES test was performed [Table 3]. Prediction the efflux by P-glycoprotein metabolism of the hit compounds is carried out by a family of the microsomal enzymes CYP-2C9, CYP-3A4, CYP-1A2, and CYP-2C19 which has been shown in [Table 4]. Finding out the protein-drug binding affinity, the Prime MM-GBSA (GB stands for Generalized Born) module of the Schrodinger software was used. All the selected hits were subjected to that module. The binding free energy of the selected hits as complex with the target has been identified in [Table 5]. Superimpose is an alignment technique where we can identify that all the selected hits occupied the same active binding sites. For this analysis, all the selected hits were superimposed on the crystal structure (PDB ID: 4BCJ) that occupied this region. The binding pattern was found similar to the active site crystallized inhibitor. This superimpose structure of the hits compound is very important for further analysis [Figure 9]. So many advances in the treatment of death leading diseases have been made over the past few decades. 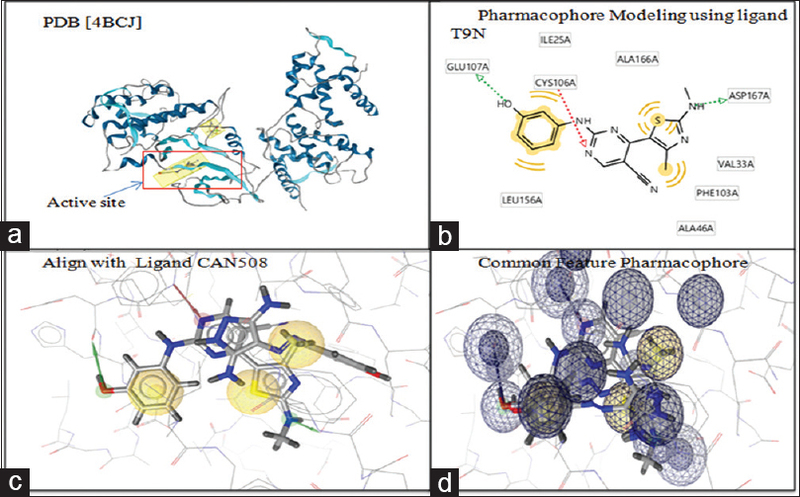 However, looking for the development in this research ligand-based and structure-based pharmacophore modeling was done, which gives the best hits according to the same features. A range of the Bioinformatics tools and techniques were used to discover the best hits. MDPI, ZINC, MayBridge drug library were subjected for the screening out the hits against CDK9/Cyclin T1 kinase in a very rapid manner and docking was also performed by Schrodinger software. Drug likeliness, ADMET, MMGBSA analysis also be done for the same. The best 11 hits were found promising and showed best inhibitory properties. Among all, hit 1, 2-[4-[6-(isopropylamino) pyrimidin-4-yl]-1H-pyrrolo [2,3-b] pyridin-6 yl] amino] ethanol was found to be more potent and selective. It is understandable that these hits could be as selective and potent anticancer agents of cyclin-dependent kinase complex. Morgan DO. 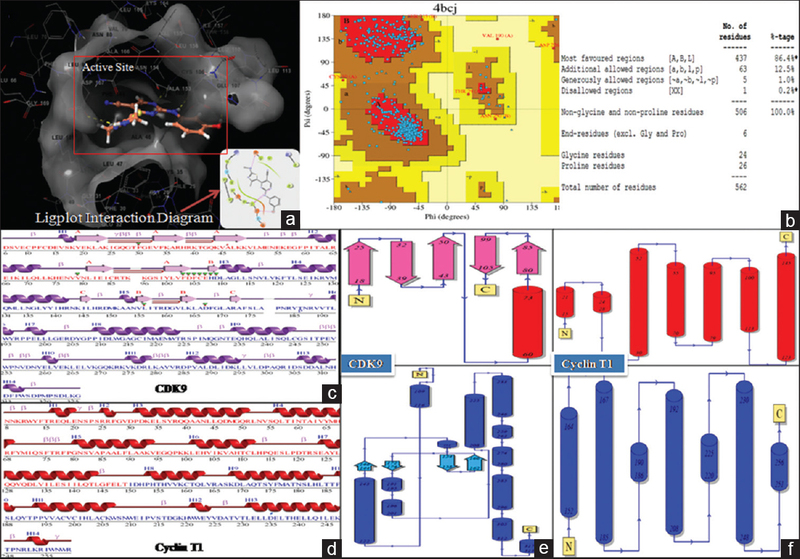 Cyclin-dependent kinases: Engines, clocks, and microprocessors. Annu Rev Cell Dev Biol 1997;13:261-91. Nigg EA. Cyclin-dependent protein kinases: Key regulators of the eukaryotic cell cycle. Bioessays 1995;17:471-80. Vermeulen K, Van Bockstaele DR, Berneman ZN. The cell cycle: A review of regulation, deregulation and therapeutic targets in cancer. Cell Prolif 2003;36:131-49. Chao SH, Fujinaga K, Marion JE, Taube R, Sausville EA, Senderowicz AM, et al. Flavopiridol inhibits P-TEFb and blocks HIV-1 replication. J Biol Chem 2000;275:28345-8. Gray N, Détivaud L, Doerig C, Meijer L. ATP-site directed inhibitors of cyclin-dependent kinases. Curr Med Chem 1999;6:859-75. Falco GD, Neri LM, Falco MD, Bellan C, Yu Z, Luca AD, et al. Cdk9, a member of the cdc2-like family of kinases, binds to gp130, the receptor of the IL-6 family of cytokines. Oncogene 2002;21:7464-70. Peng J, Zhu Y, Milton JT, Price DH. Identification of multiple cyclin subunits of human P-TEFb. Genes Dev 1998;12:755-62. Fu TJ, Peng J, Lee G, Price DH, Flores O. Cyclin K functions as a CDK9 regulatory subunit and participates in RNA polymerase II transcription. J Biol Chem 1999;274:34527-30. Garriga J, Graña X. Cellular control of gene expression by T-type cyclin/CDK9 complexes. Gene 2004;337:15-23. Zhu Y, Pe'ery T, Peng J, Ramanathan Y, Marshall N, Marshall T, et al. Transcription elongation factor P-TEFb is required for HIV-1 tat transactivation in vitro. Genes Dev 1997;11:2622-32. Wei P, Garber ME, Fang SM, Fischer WH, Jones KA. A novel CDK9-associated C-type cyclin interacts directly with HIV-1 tat and mediates its high-affinity, loop-specific binding to TAR RNA. Cell 1998;92:451-62. Desai D, Gu Y, Morgan DO. Activation of human cyclin-dependent kinases in vitro. Mol Biol Cell 1992;3:571-82. De Falco G, Giordano A. CDK9: From basal transcription to cancer and AIDS. Cancer Biol Ther 2002;1:342-7. Wang S, Griffiths G, Midgley CA, Barnett AL, Cooper M, Grabarek J, et al. Discovery and characterization of 2-anilino-4- (thiazol-5-yl) pyrimidine transcriptional CDK inhibitors as anticancer agents. Chem Biol 2010;17:1111-21. Krystof V, Cankar P, Frysová I, Slouka J, Kontopidis G, Dzubák P, et al. 4-arylazo-3,5-diamino-1H-pyrazole CDK inhibitors: SAR study, crystal structure in complex with CDK2, selectivity, and cellular effects. J Med Chem 2006;49:6500-9. Baumli S, Endicott JA, Johnson LN. Halogen bonds form the basis for selective P-TEFb inhibition by DRB. Chem Biol 2010;17:931-6. Schmerwitz UK, Sass G, Khandoga AG, Joore J, Mayer BA, Berberich N, et al. Flavopiridol protects against inflammation by attenuating leukocyte-endothelial interaction via inhibition of cyclin-dependent kinase 9. Arterioscler Thromb Vasc Biol 2011;31:280-8. Bettayeb K, Baunbæk D, Delehouze C, Loaëc N, Hole AJ, Baumli S, et al. CDK inhibitors roscovitine and CR8 trigger mcl-1 down-regulation and apoptotic cell death in neuroblastoma cells. Genes Cancer 2010;1:369-80. Berberich N, Uhl B, Joore J, Schmerwitz UK, Mayer BA, Reichel CA, et al. Roscovitine blocks leukocyte extravasation by inhibition of cyclin-dependent kinases 5 and 9. Br J Pharmacol 2011;163:1086-98. Kryštof V, Rárová L, Liebl J, Zahler S, Jorda R, Voller J, et al. The selective P-TEFb inhibitor CAN508 targets angiogenesis. Eur J Med Chem 2011;46:4289-94. Krystof V, Baumli S, Fürst R. Perspective of cyclin-dependent kinase 9 (CDK9) as a drug target. Curr Pharm Des 2012;18:2883-90. Senderowicz AM, Sausville EA. Preclinical and clinical development of cyclin-dependent kinase modulators. J Natl Cancer Inst 2000;92:376-87. Zhang J, Yang PL, Gray NS. Targeting cancer with small molecule kinase inhibitors. Nat Rev Cancer 2009;9:28-39. Rella M, Rushworth CA, Guy JL, Turner AJ, Langer T, Jackson RM, et al. Structure-based pharmacophore design and virtual screening for novel angiotensin converting enzyme 2 inhibitors. J Chem Inf Model 2006;46:708-16. Steindl TM, Schuster D, Wolber G, Laggner C, Langer T. High-throughput structure-based pharmacophore modelling as a basis for successful parallel virtual screening. J Comput Aided Mol Des 2006;20:703-15. Wolber G, Dornhofer AA, Langer T. Efficient overlay of small organic molecules using 3D pharmacophores. J Comput Aided Mol Des 2006;20:773-88. Markt P, Schuster D, Kirchmair J, Laggner C, Langer T. Pharmacophore modeling and parallel screening for PPAR ligands. J Comput Aided Mol Des 2007;21:575-90. Prasad NK, Kanakaveti V, Eadlapalli S, Vadde R, Meetei AP, Vindal V. Ligand-based pharmacophore modeling and virtual screening of RAD9 inhibitors. J Chem 2013;2013:7. Vuorinen A, Engeli R, Meyer A, Bachmann F, Griesser UJ, Schuster D, et al. 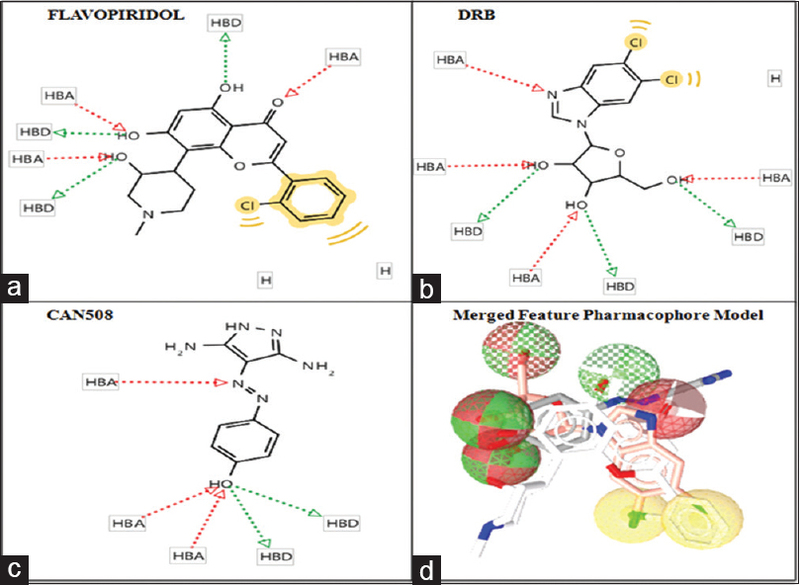 Ligand-based pharmacophore modeling and virtual screening for the discovery of novel 17β-hydroxysteroid dehydrogenase 2 inhibitors. J Med Chem 2014;57:5995-6007. Kaserer T, Beck KR, Akram M, Odermatt A, Schuster D. Pharmacophore models and pharmacophore-based virtual screening: Concepts and applications exemplified on hydroxysteroid dehydrogenases. Molecules 2015;20:22799-832. Hochleitner J, Akram M, Ueberall M, Davis RA, Waltenberger B, Stuppner H, et al. A combinatorial approach for the discovery of cytochrome P450 2D6 inhibitors from nature. Sci Rep 2017;7:8071. Hussain A, Verma CK, Chouhan U. Identification of novel inhibitors against cyclin dependent kinase 9/cyclin T1 complex as: Anti cancer agent. Saudi J Biol Sci 2017;24:1229-42. Klimenko K, Lyakhov S, Shibinskaya M, Karpenko A, Marcou G, Horvath D, et al. Virtual screening, synthesis and biological evaluation of DNA intercalating antiviral agents. Bioorg Med Chem Lett 2017;27:3915-9. Lei B, Heng N, Dang X, Liu J, Yao X, Zhang C, et al. Structure based in silico identification of potentially non-steroidal brassinosteroids mimics. Mol Biosyst 2017;13:1364-9. Perricone U, Wieder M, Seidel T, Langer T, Padova A, Almerico AM, et al. A molecular dynamics-shared pharmacophore approach to boost early-enrichment virtual screening: A case study on peroxisome proliferator-activated receptor α. ChemMedChem 2017;12:1399-407. Wieder M, Garon A, Perricone U, Boresch S, Seidel T, Almerico AM, et al. 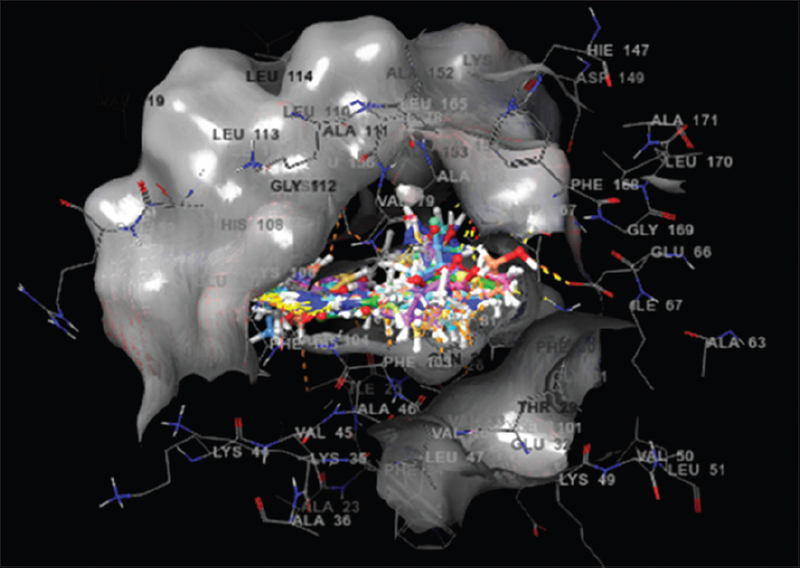 Common hits approach: Combining pharmacophore modeling and molecular dynamics simulations. J Chem Inf Model 2017;57:365-85. McInnes C. Virtual screening strategies in drug discovery. Curr Opin Chem Biol 2007;11:494-502. Tuccinardi T. Docking-based virtual screening: Recent developments. Comb Chem High Throughput Screen 2009;12:303-14. Hole AJ, Baumli S, Shao H, Shi S, Huang S, Pepper C, et al. 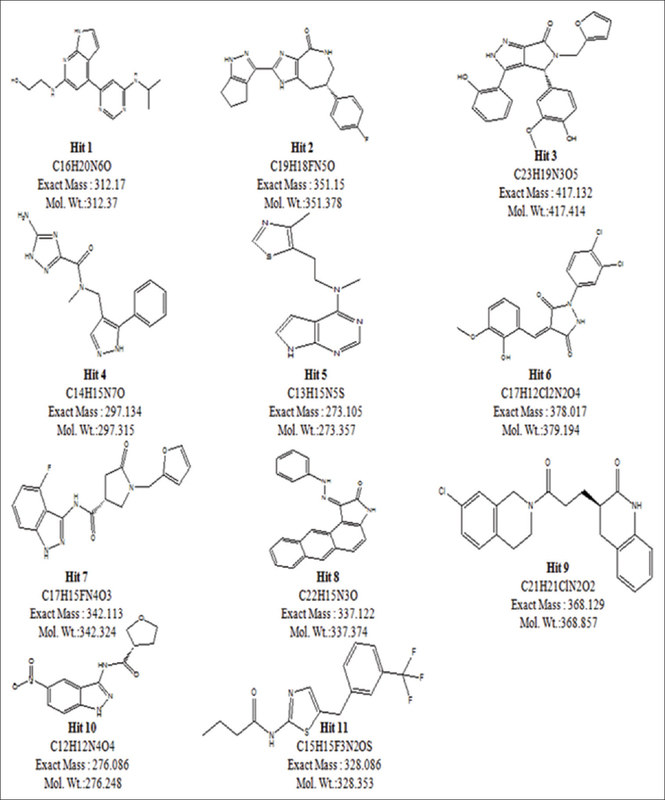 Comparative structural and functional studies of 4-(thiazol-5-yl)-2-(phenylamino) pyrimidine-5-carbonitrile CDK9 inhibitors suggest the basis for isotype selectivity. J Med Chem 2013;56:660-70. Banks JL, Beard HS, Cao Y, Cho AE, Damm W, Farid R, et al. Integrated modeling program, applied chemical theory (IMPACT). J Comput Chem 2005;26:1752-80. Friesner RA, Murphy RB, Repasky MP, Frye LL, Greenwood JR, Halgren TA, et al. Extra precision glide: Docking and scoring incorporating a model of hydrophobic enclosure for protein-ligand complexes. J Med Chem 2006;49:6177-96. Lipinski CA, Lombardo F, Dominy BW, Feeney PJ. Experimental and computational approaches to estimate solubility and permeability in drug discovery and development settings. Adv Drug Deliv Rev 2001;46:3-26. Yamashita F, Hashida M. In silico approaches for predicting ADME properties of drugs. Drug Metab Pharmacokinet 2004;19:327-38. Lyne PD, Lamb ML, Saeh JC. Accurate prediction of the relative potencies of members of a series of kinase inhibitors using molecular docking and MM-GBSA scoring. J Med Chem 2006;49:4805-8.